Formula 6 is almost an institution it has been going so long. In the next breath, we can only plan for up to 6 months ahead as we just don’t know what lies ahead. Coffee is still very much a seasonal affair, although there are some coffees that we try and keep for longer than just the breeze of a trend. The blend elements are a-changing. Thank goodness for new crop deliveries! fresh additions to the blend make it both a challenge and a delight ..with ridiculously good naturals (where we can) and top estate coffees too. 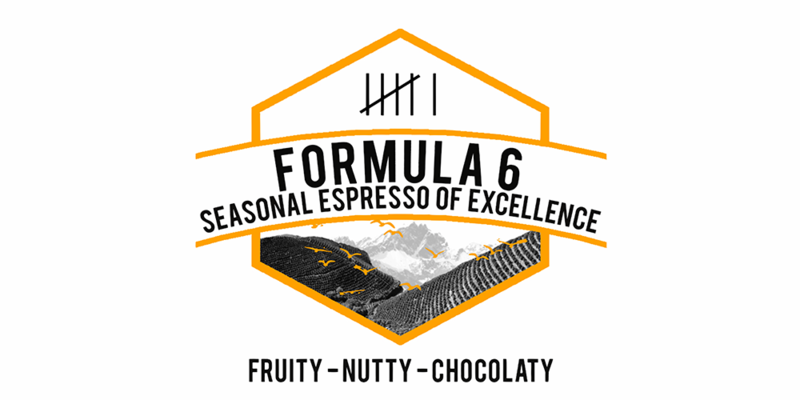 Also, the caliber of coffee in Formula 6 seriously takes some beating. The sweet clean acidity and fruit sugars work really well. We have been working with 16-18g of coffee into 45-50g of liquid makes for great shots of espresso and a complex existence in milk too. If you are brewing this really fresh and just don’t have the time to wait for the coffee to open up, by pulling 17-18g into 35g of liquid, you cancel out the negatives of a fresh long shot, but if you can wait, you can use less coffee and have better espresso.